Recently my i30 reached a Coolant temperature of 120° and narrowed it down to a faulty Thermostat. The day after I replaced the thermostat and replaced the coolant and went for a ride and it worked fine however I heard gurgling sounds when pressing the gas pedal. The day after I went to work and on my way I saw fumes/vapor coming out from the air vents! My mechanic told me that there is air in the system and we bleeded the system more than knce. The vapor could most likely be an issue with the Heat Matrix for the past week I have been topping up the coolant but the day after I find the radiator empty. The gurgling sounds are still there but no visible leaks under the car, inside the car and in the engine bay. The engine temperature remains stable at around 85-90° and the car works fine but still very curious where the coolant is going and why the gurgling noise can still be heard. Any one have ever had this issue or something similar? Is this model known for issues with the water system? The car is serviced regularly by myself and I always use the highest quality possible when it comes to oil, antifreeze and parts. The car has 98,000km and last service was in November 2018. I'm not sure but I'll throw this out there. Define radiator empty please. Does this mean if you opened the drain plug no coolant would come out? Or are you saying with the cap off you don't see any coolant and the overflow tank is empty. Where are the gurgling sounds coming from? Inside the cabin? Fumes / Vapour from vents, Is this with A/C on or off? If coolant level is always too low after daily topups, then I think your mechanic should pressure test the system and see if it holds or if it drops then that would be a leak and then you could search for evidence of coolant escaping. Is the radiator cap good and holding pressure? How's the oil? any signs of water getting in there, milkiness in the cap ? Coolant when opening the radiator cap is low, overflow tank is full only dropped between low and full once. Gurgling sound coming in the cabin behind the dashboard. Vapor comes out when the heat is on with the AC off. The oil does not look milky both from the oil cap and dip stick. The radiator cap does not loom like it is leaking but I can try and replace it since I don't think it is expensive. Is there somesort of DIY pressure teat I can make? if radiator cap seal is faulty you will get high temps. Correct pressure raises the boiling point. You keep saying vapour from vents> I assume you mean vents inside the car/ on dash? The gurgling could be air in the cooling system, but from what you report that should have gone by now. My crystal ball says that your heater core or a hose is leaking. Therefore you get steam in the cabin and loss of coolant. crystal ball also says something is getting wet. eg carpet, firewall lining, or your feet. Have you checked any of these areas? Yes the air vents I was referring to the ones in the cabin. 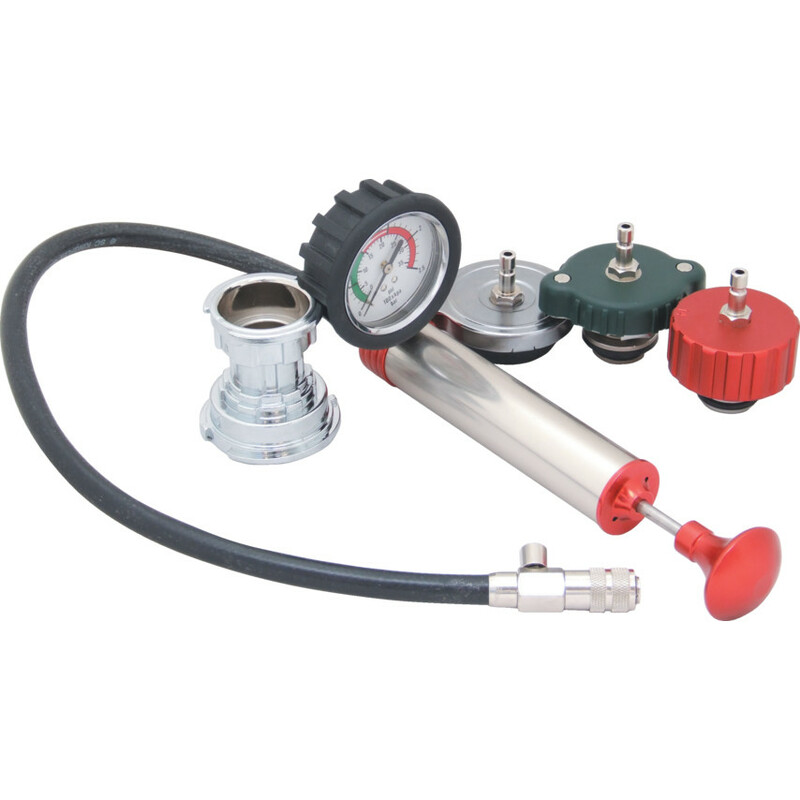 pressure tester is a specialised bit of kit all decent garages should have or Radiator specialists. It helped me trace a slow coolant loss which appeared at the rear of an engine block only to prove to be from the front from the water pump which was concealed. I was thinking to buy one myself since you can get them for around €60 but I don't think it's worth it to buy it for only this fault. Was the fault you had on a Hyundai i30 2007? Does anyone have a repair manual for this car? Or do you have any idea if I have to pull out the dashboard to locate the heat core? It's a big job, is all I'll say. I'd be pressure testing and looking for leaks inside the car before I even thought about that unless you're confident it is leaking. Lift he carpet and see if there is any evidence. Yeah I think that's the best way forward. A small update just noticed some water and the drivers side! Went down to check and found vapor coming out from the Heat core so I guess found the culprit . I am trying to find a way to replace it without getting the dash out since it is located just beside the foot rest near the clutch pedal. Again thanks all for your feedback and help. Not possible, it's encased in an entire HVAC assembly, at least I'd be amazed if the dash can stay. RHD variant I stripped out from a wreck. Only yesterday, just to demonstrate, wreck owner still loved driving it, very unhappy. even as I relax in Taupo, my cball informs me about his latest stunts and oscillating mental state.